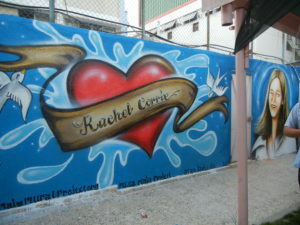 The Rachel Corrie Foundation (RCF) proudly partnered with the Palestine-Israel Working Group of Nevada County, California, to help fund construction of a water purification unit, through the Middle East Children’s Alliance (MECA) Maia Water Project. 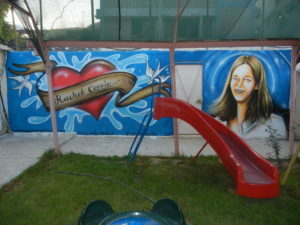 In 2011 RCF partnered with MECA to build a water purification unit at a kindergarten in Rafah as part of the Maia Mural Brigade. In 2013 we partnered again with MECA to bring potable water to the Naseam Kindergarten in Nuseirat camp just outside the city of Deir al-Balah. Read on to find out more about the Maia Water Project and the Maia Mural Brigade. MECA’s MAIA Project was launched in September 2009 to provide Palestinian children with clean, safe drinking water. MECA’s MAIA project began when the Student Parliament at the UN Boys’ School in Bureij Refugee Camp, Gaza were given the opportunity to choose one thing they most wanted for their school: They chose to have clean drinking water. MECA’s partner in Gaza, Afaq Jadeeda Association, heard about this vote and, after meeting with representatives from the school and the Student Parliament, came to MECA to see if they could respond to the children’s request for drinking water. MECA provided the funds to build a water purification and desalination unit for the school in 2007. The water crisis in Gaza is severe. It began in 1948 with the forceful displacement of tens of thousands of Palestinians into the Gaza Strip. Israel simultaneously cut access to all water sources around Gaza. The Gaza Aquifer, the only remaining water source, was unable to support the sudden rise in population. Due to this incredible strain, the water generated by the aquifer has been steadily deteriorating for more than sixty years. The three-year siege of Gaza combined with Israeli military attacks during Operation Cast Lead (Dec. 2008-Jan. 2009) brought the already deteriorated water and sanitation sector to the brink of collapse. As a result, the water in Gaza is polluted with untreated sewage, agricultural chemicals, and is brackish from seawater. This leads to significant health problems including parasitic infections, heart disease, and life-threatening anemia. The United Nations reports that as much as 95% of the water in Gaza is unsuitable for human consumption due to contamination by seawater, sewage, and agricultural and industrial waste. To provide drinking water to children, who are disproportionately affected by this crisis, MECA has built 40+ units for UN schools, refugee camps, small towns and villages, and is currently expanding its efforts to reach more schools throughout Gaza. Each school’s water purification unit will provide safe and clean drinking water to between 150 and 450 students. Through this partnership, the Rachel Corrie Foundation will continue its commitment to peace, justice, and the welfare of the people of Gaza. 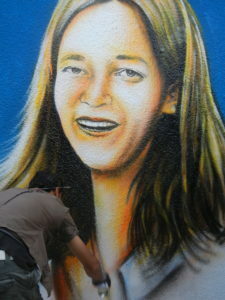 Maia Mural Brigade is a multimedia public-art project with artists, activists and youth from Palestine and around the world in Gaza, occupied Palestine. 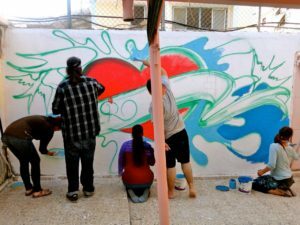 By partnering with on-the-ground activist organizations in Gaza including the Middle East Children’s Alliance (MECA), MAIA Mural Brigade uses art to ignite concrete action for environmental justice. In 2011, the MAIA Mural Brigade collaborated with Estria Foundation’s #WaterWrites project and MECA. To date, 9 murals have been painted across Gaza. All but one are located at the sites of water purification and desalination systems being installed by the Middle East Children’s Alliance, providing clean water to more than 50,000 children.